Comprehensive review of Fine Vine Natural Retinol Cream. See how this retinol cream compares against other wrinkle creams! 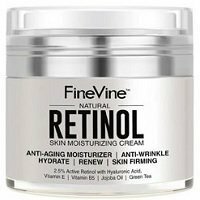 Fine Vine Natural Retinol Cream is a natural retinol cream which I appreciate, but unfortunately it didn’t work for my skin at all. The texture and feeling of this retinol cream is very thick and very greasy, and it leaves your skin feeling super greasy even after it’s dry. This cream is pretty easy to apply, and you only need 1 full pump to cover your entire face, neck, and chest because the applicator puts out a lot of product. I didn’t really notice any difference short term; I did notice a bit that my pores started to feel kind of clogged but I didn’t notice much. After using this Fine Vine Natural Retinol Cream for a longer period of time, I noticed that this product didn’t work for my skin at all. It clogged my pores and made my skin break out very badly all over my face and neck. Not only did it make my skin break out like crazy, but it didn’t help with my fine lines and wrinkles at all. The greasy texture didn’t help moisturize my skin; it just sat on the surface and clogged my skin. Overall, Fine Vine Natural Retinol Cream didn’t work for my skin at all and I think it’s too thick of a product for anyone with very sensitive or breakout prone skin. The texture of Fine Vine Natural Retinol Cream is very thick; it feels much thicker than a normal cream. It almost reminds me more of a hand lotion than a face cream. It feels pretty greasy, and that greasy feeling stays on your skin even after it’s fully applied and dry. Fine Vine Natural Retinol Cream comes in a short bottle with a pump at the top which makes it pretty easy to apply. Although, since the product dispenses on top and not out of the side, it makes it really difficult to control the amount of product that comes out. I found that it dispenses way more product than needed. Since one pump gives you a lot of product, you definitely only need that one pump to cover your entire face, neck, and chest. Fine Vine Natural Retinol Cream takes about 30 seconds to dry down but it never totally dries down, that greasy feeling stays on the skin. The smell of Fine Vine Natural Retinol Cream smells kind of like plastic; it definitely doesn’t smell good at all. I really don’t like it. After using Fine Vine Natural Retinol Cream, I really didn’t notice much of a difference at all, although my pores did start to clog a bit. Over a longer period of time using Fine Vine Natural Retinol Cream, my skin started to react very negatively. My pores were completely clogged and I began to break out all over my face. I even broke out down my neck. I also didn’t notice any difference at all to the fine lines and wrinkles on my face. I only noticed negative differences. Fine Vine Natural Retinol Cream is a natural retinol cream and contains a bunch of interesting ingredients. A few of those ingredients include aloe, hyaluronic acid, and green tea. Aloe is a very healing ingredient which can help the skin heal fine lines and wrinkles and can also help the skin produce more collagen. Hyaluronic acid is an ingredient that helps lock moisture into the skin and can really help plump up the skin. Green tea is another ingredient that is great for fine lines and wrinkles because it’s very soothing, moisturizing, and healing. These three ingredients are great and could really help the skin with anti-aging and help plump up fine lines and wrinkles. The cost of Fine Vine Natural Retinol Cream is $18.97 for 1 oz of product. This is a bit of a higher price for a retinol cream. Unfortunately, I couldn’t find any return policy for Fine Vine Natural Retinol Cream. To buy Fine Vine Natural Retinol Cream, click here.